The INSTI HIV-1/HIV-2 Antibody rapid test is a single use, rapid, flow-through in vitro qualitative immunoassay for the detection of antibodies to Human Immunodeficiency Virus Type 1 and Type 2 in human EDTA whole blood, fingerstick blood, serum or EDTA-plasma. The test is intended for use by trained personnel in medical facilities, clinical laboratories, emergency care situations, and physicians’ offices as a diagnostic test capable of providing results in less than one minute. Although suitable for near-patient or point-of-care (POC) testing, the INSTI HIV-1/HIV-2 Antibody Test is not suitable for home testing. All required pre and post-test counselling guidelines must be followed in each setting in which the INSTI HIV-1/HIV-2 Antibody Test is used. 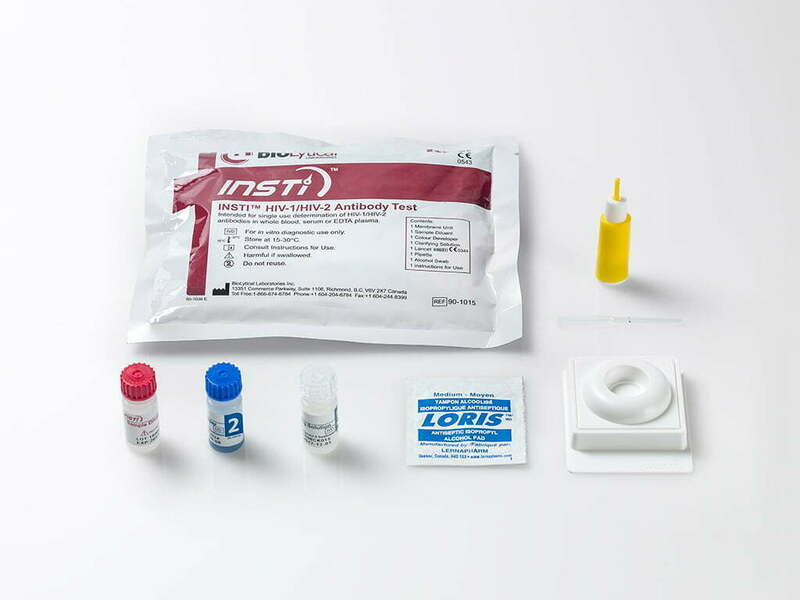 The assay is packaged as a kit containing INSTI Membrane Unit, Sample Diluent (Solution 1), Color Developer (Solution 2), and Clarifying Solution (Solution 3) with or without support materials (lancet, pipette and alcohol swab).